Memory plays a crucial role in the music of Wheat, one of the most enigmatic and compelling rock bands of the past decade. And never more profoundly has the theme, the act, of remembering played so critical a role in the making of that music than on the Massachusetts outfit's stunning new Empyrean Records CD, Everyday I Said A Prayer For Kathy And Made A One Inch Square. Even the album's cryptic title, drummer Brendan Harney explains, is "about remembering through a ritual. We lose things we love, sometimes, in life. People turn corners and things change ... Then we decide to make a square, simply to remember? hope, maybe." Wheat's fourth full-length album, and the core of the band itself, is about all of those things. "We didn't know what the hell we were doing," Harney laughs. "We were the least career minded band I've ever come across. Everything was about magic. Like children. We just let it fly, the rest be damned." Formed by two students at the University of Massachusetts Dartmouth - Scott Levesque (vocals, guitar) and Brendan Harney (drums), soon afterwards joined by Ricky Brennan (guitars, vocals) - WHEAT was originally conceived as an art project. About the only thing that was known for sure about their 1998 debut MEDEIROS at the time of its release was that it was mixed with Brian Deck (Red Red Meat): the band's official bio was little more than a chronology of the band's various line-ups, first names only, and the album's artwork gave away even less. Despite this, however, the mysterious, hazy, low key debut yielded an NME Single Of The Week, Death Car, as well as a bumper crop of superlatives from the press on both sides of the Atlantic. HOPE & ADAMS, its follow-up (released in 2000), saw the band shift up a gear, employing renowned producer Dave Fridmann to develop their ideas whilst remaining true to their original intentions. The response to HOPE & ADAMS was unanimous: a truly great American indie rock band had arrived, and in Don't I Hold You - employed to great effect by Cameron Crowe in the movie Elizabethtown - they had one of the most simple but heartbreaking love songs of the year. The band, meanwhile, toured extensively, building up an impressive reputation for both stretching out their songs and their charismatic stage presence - Levesque as frontman was coy but captivating, Harney as pearl-necklaced drummer an eccentric but hypnotic force behind the kit. WHEAT looked all set for mainstream but unusually uncompromised success. As so often happens, however, fate (or perhaps poor management) conspired against them: the band was advised to leave their European label in favor of another that, unbeknownst to them, was about to fold. Mere days after the deal was signed news reached them that their album was now an asset of a company that had gone out of business. Dense legal battles followed, and though the band emerged intact over a year later to sign with Aware / Sony, the record - the typically cryptically titled PER SECOND, PER SECOND, PER SECOND... EVERY SECOND - had not emerged so unscathed. Instead it had been remixed and in places re-recorded, largely at the label's behest, and was consequently rendered comparatively lifeless (although it still went on to sell over 35,000 copies in the US). In the end - fortunately, some might argue - it was never released outside of North America. Brennan quit the band while Levesque and Harney retreated into a long silence, exhausted and disillusioned. Rumors that WHEAT had broken up were not too far from the truth. "We couldn't do the monkey suits and the handshakes well at all," Harney explains. "We were terribly unhappy so we started to play it in a way where we could just get out and get on with life. It didn't work out 'cause it was a completely fucked-up fit. Scott and I started WHEAT as an art project, and the second we let other people's opinions slip in is when it started to come apart. We needed to walk away from the whole thing. The things we loved, the art of what we did, the control of what we were about seemed to be slipping, so we had to jump." After a while, however, Levesque and Harney began to talk again and, restless to make music once more, they reconvened in the summer of 2005 to try out new tracks just to see where the songs and ideas might lead. This time they had no label. They had no recording schedule. They had no deadlines. But they remembered the old rituals, and in doing so, discovered they were able to reclaim the supernal sound, ineffable chemistry, and music-magic of Wheat. "We were in that great spot again," says Levesque. "We make records in our own little world, and that's where we went to. We really tried to get back into the flow with this music, the abstract nature of communicating with depth and detail, communicating what we all feel when we love. We work hard at keeping the spirit of the original thought alive, which is why we try not to "perfect" anything. We wanted to challenge the idea of a professional record. Everything today is made as perfectly as possible, and we wanted to have this feel as real and as human as possible. I think we did that, and we did it without sacrificing the power of the music." With EVERYDAY I SAID A PRAYER FOR KATHY AND MADE A ONE INCH SQUARE, WHEAT are back amongst us in our world, right where they belong. What began 10 years ago as a brilliant art project in sound has now been restored to its beginnings, original luster restored. From the celestial shimmer of Closeness, which opens the new album, to the pastoral instrumental poem, Courting Ed Templeton, which closes it, EVERYDAY I SAID A PRAYER... marks a splendid return to the incandescent form that yielded 1997's delicious MEDEIROS and 1999's indie-pop gem HOPE AND ADAMS. And the album's curious title? "It's about remembering through a ritual", Harney clarifies. "We lose things we love, sometimes, in life. People turn corners and things change, and we try to remember. We make art, but art becomes stylized. Then we decide to make a square, simply to remember. Or hope, maybe." WHEAT still don't know what the hell they are doing. They are still the least career minded band you'll ever come across. Everything remains about magic. Like children. They just let it fly, the rest be damned. Enigmatic and epic - and they're not from Montreal! After their minor 2003 hit "I Met A Girl" and a prolonged hiatus, this hooky Massachusetts band returns with its fourth and most rousing collection of heart-on-sleeve anthems. Boasting church organs, yearning vocals, and strings, they're no less self-possessed than Arcade Fire, and your probably won't hear three beautifully sweeping songs start another album this year: the majestic devotional rock of "Closeness", the hopeful (almost folk-funk!) bounce of "Little White Dove, and the existential, Pavement-gone-power-pop groove of "Move=Move". ..When a WHEAT song works it is unlike anything else in modern rock. "Closeness" is damn near the best thing they've done, with its triumphant climax of Scott Levesque's warming "Oooos" and drummer Brendan Harney's ringing cymbal crashes. It seems they've finally learned how to maintain the magic of Hope & Adams but draw it out a little fuller." It doesn't seem like 10 years. Wheat's debut, Medeiros, feels as fresh as yesterday, which is very fresh. But it was released in 1997. If you remember when it came out, think for a second that you are now a decade older than when you first heard it. This is a very long time in people years. You only get like seven or eight of those chunks and then you're done. Since releasing Medeiros in 1997, Wheat - Scott Levesque and Brendan Harney - have been through quite a lot. Their recording career continued in 1999 with a wildly well-received album titled Hope and Adams. One of the best local discs of the year, H&A; transformed Wheat into a shining star on the national indie scene. That, in turn, led to a major label dalliance for their 2003 disc, Per Second, Per Second, Per Second, Every Second (Aware). The record actually yielded a hit single, "I Met a Girl," the first time that's happened for a local band in a long time, and appearances on national late-night TV with dudes like Carson and Conan. Despite the relative success, the duo didn't make more albums for Aware before they sauntered off, exhausted and disillusioned. We're not sure why the label liaison lasted for only a single album, though we've heard this sad story many times before and have our guesses. Following the foray, the band retreated. A mini-album, That's Exactly What I Wanted . . . Exactly That, appeared in 2006. Which brings us to the band's new full-length, Everyday I Said a Prayer for Kathy and Made a One Inch Square, out this week on Empyrean, the stellar, Warren-based record label. Listening to it, it's as if the band has come full-circle, boomerang-like, to their art school roots. They've journeyed through the labyrinth of pop, and have now returned to the arty sound of their origins at UMass Dartmouth. Only Everyday is better, more fully realized, the sound of a band that can now approach the concept of recording with confidence and resolve. Songs such as "Little White Dove" and "Move = Move" shimmer with polite but potent rock melodies. There's lots of fun hoo-hooin' and sweet indie hooks mixed in with organic, even psychedelic experimentation on work such as "Saint In Law" and "What You Got." It's all very chill, though - both the pop songs and the sound washes are all kicked back and easy to hear, pretty much like everything else Wheat has recorded in their decade together. It would have been a shame if Wheat had folded, as rumored, in the fallout from the major-label nightmare that yielded its bland third album, "Per Second, Per Second, Per Second ... Every Second." But the Boston trio didn't fold, and eventually Wheat's founding members - singer-guitarist Scott Levesque and drummer Brendan Harney - reconvened in the pressure-free recording environment responsible for their acclaimed earlier albums, 1998's "Medeiros" and 2000's "Hope & Adams." They emerged with "Everyday I Said a Prayer for Kathy and Made a One Inch Square," which resembles "Per Second" in sprawling title alone. Wheat's essential trick has always been soothing the soul with raspy, heartfelt (and sometimes cryptic) refrains over twinkling, homemade rock. On the opening "Closeness," Levesque gently repeats, "You mean so much more to me than anything," and it's probably the simple beauty of the title refrain that makes "I Had Angels Watching Over Me" the album's first single. Wheat songs meander and mutate in strange yet organic ways as sounds fade in and out of view amid alt-country tinges, breathy pop touches and the lyrics' grizzled optimism. That optimism, it seems, is responsible for "Everyday," which is no less than a stunning return to form. Wheat. Just saying that word, preceded by a deep breath, is soothing. It reminds me of a scene from Woody Allen's Love and Death, in which he and Diane Keaton repeat "Wheat. All there is in life: wheat" for no particular reason, other than the Woodman's eclectic sense of humor. So it's a fitting name for a Massachusetts band that was originally conceived as an art project by two students, Scott Levesque and Brendan Harney, in the late Nineties. The band has had a low-key career curve, garnering critical acclaim, but also suffering from label mishaps, culminating in a hiatus after their third release and rumors that the band had broken up. (An eerily similar story to fellow Eastern-Seaboard artists Wrens). Well, fans of Wheat may now take a deep breath: a decade after forming, they are back, and the resulting record is well worth the wait. 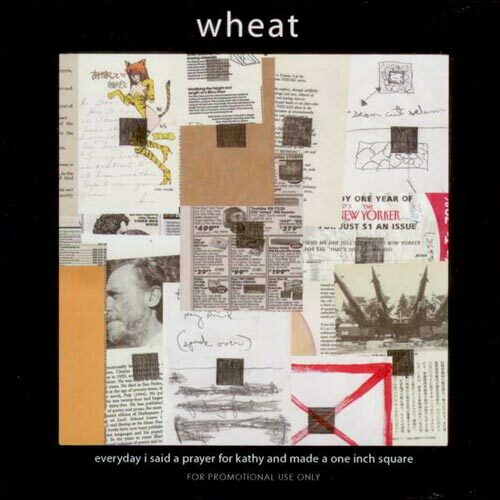 Wheat's previous albums have had cryptic titles, and their latest continues the tradition - Everyday I Said a Prayer for Kathy and Made a One Inch Square. Harney explains, "It's about remembering through a ritual. We lose things we love, sometimes, in life. People turn corners and things change, and we try to remember. We make art, but art becomes stylized. Then we decide to make a square, simply to remember. Or hope, maybe." A touching and serene sentiment, which perfectly echoes the mood of the record through the eleven song set. And nothing captures this sentiment better than the opening track, "Closeness." A subdued voice over a lingering organ note yearns "I don't seem that close to you/ the closer you get." It builds into a repetitive cascade of "ahoo" before ending on a lone organ note, disarming and beautiful. "Move=move" starts with a brushed snare and toy keyboard and the most perfect bubblegum chorus I've heard in a long time, including a sly nod to teen linguistics, "The things u love should b set free/ the things u love come naturally." "Round in the Corners" is a nice juxtaposition of world-weary words - "Worn down/ our corners are round" - accompanied by upbeat drums and slide guitar. Like most of the album, it's sung gingerly by Levesque, with perhaps a slight hint of fatigue. Similar in style to Jeff Tweedy, his voice can strike a sad tone, but always warms its way into the listener's heart. "An Exhausted Fixer" highlights the band's art leanings, mostly spoken word over strong drumming by Harney, peppered with a jubilant chorus and bright guitar leads. The record closes as discreetly as it opened with "Courting Ed Templeton," an instrumental piece of music and sound effects that tapers to a fading end. A few months ago Wheat released an EP, That's Exactly What I Wanted... Exactly That, which shares just one song with the new long-player. Although it was a very solid five song collection, it didn't quite foretell the cohesiveness and poise of Everyday I Said a Prayer. As the album title suggests, this is a restorative effort, along the lines of Wilco's Yankee Hotel Foxtrot, and indeed both are releases from bands that were knocked down, but not out. Reconvening with Harney in 2005, without a label, Levesque recalls that "We were in that great spot again. We make records in our own little world, and that's where we went to." Everyday I Said a Prayer is the tranquil triumph. "...One of Boston's most beloved abstractionist indie-pop bands return with an album of substantial yet understated beauty, built around the evanescent tides of memory, love, and loss." Wheat is a subtle bittersweet gem..some place between Sparklehorse's backporch melancholy and U2's widescreen majesty...Wheat seduce you gradually, revealing its delights over time. The first listen may wash you over, but preserve and you'll find yourself smitten by these precious, lovelorn gems. Wheat bring startling fine song writing and an obvious love for their craft...The darkness of their sentiment set them in a league of their own. Loving them like they want to be loved couldn't be easier. The 60-watt glow of Wheat gently pushes you in the back with two palms. But this is an encouraging push - not an annoying push - info fields of amber organs, where crystalline spires of guitar rise into a sky of matte, reachable teal. At high volumes, the trembling synths and bass pleasantly rattle your teeth like chewing on aluminum foil...Wheat's suddenly pleasantly in front of the pack thanks to large, lily-white sails...The unwavering mood and pace offer few disappointments. Wheat swim with melodic poise and impressive ache through the ultra violet mist..another hip triumph for producer Dave Fridmann, who's fine lysergic touch flatters the slow-boil grace and the warming streaks of sunlight in Wheat's fogged-in strum.